Paperless Technologies allows your office to eliminate paper without altering how your dental or medical practice functions. With digital pen and paper, you can easily add digital signatures to informed consents, HIPAA forms, and any documents that require a patient, doctor, or witness signature. Paperless Technologies allows you to electronically record health histories, dental histories, and questionnaires. In addition, all forms and questionnaires automatically transfer to your clinical areas, allowing them to be accessed from anywhere in your office. By eliminating paper charts, Paperless Technologies will increase your floor space, reduce or eliminate off-site storage fees, and eliminate material costs for charts and paper documents. Furthermore, Paperless Technologies will reduce or eliminate costs associated with making copies and printing. Paperless Technologies provides instant access to patient charts and business records, in office or remotely. We also offer customizable electronic charts and clinical records, including treatment acceptance forms, accessible at the click of a button. Paperless Technologies transfers new patient data into your practice management program, saving valuable time by eliminating manual entry, and also promoting greater accuracy. Our software allows you to pull medical history, insurance, and medical alert lists from your practice management programs to use with forms. With Paperless Technologies, patients can check in at each appointment using just their fingerprint. After check in, forms and questionnaires automatically pull up, allowing patients complete and sign them with a tablet and tablet pen. Your patients' handwriting will be converted to text, and Paperless Technologies will alert your staff of any missing signatures. Paperless Technologies also automatically alerts you when forms need to be updated. Running statistical reports for specific patient information is quick and easy. Our software can build powerful logic-driven questionnaires and surveys. Furthermore, finding existing patient charts, letters, and documents can be done with a click of a button. Paperless Technologies software allows patients to complete forms or questionnaires from the comfort of their own homes, which is convenient for them and efficient for your front office. Build your own questionnaires with powerful and user-friendly Q & A query system. With Paperless Technologies, you can electronically add a patient's signature to any document. With a click of a button, Paperless Technologies transfers patients' data from your management software, eliminating double entry. Find existing patient charts, letters, and documents easily with a click of a button. Paperless Technologies eliminates labor costs to file, copy, and pull patient records. It also eliminates liability and the frustration of missing charts. Any document in the Paperless Technologies database can be printed, complete with an embedded signature. Paperless Technologies will also alert your front desk of missing signatures. Paperless Technologies reduces the risk of misplacing or losing critical documents. Furthermore, all records are available, current, and secure (HIPAA) with off-site backup. This will protect your patient records from unforeseen circumstances and catastrophes. With Paperless Technologies, your patients don't have to write the same information repetitively; Paperless Technologies will automatically insert information into all applicable forms. 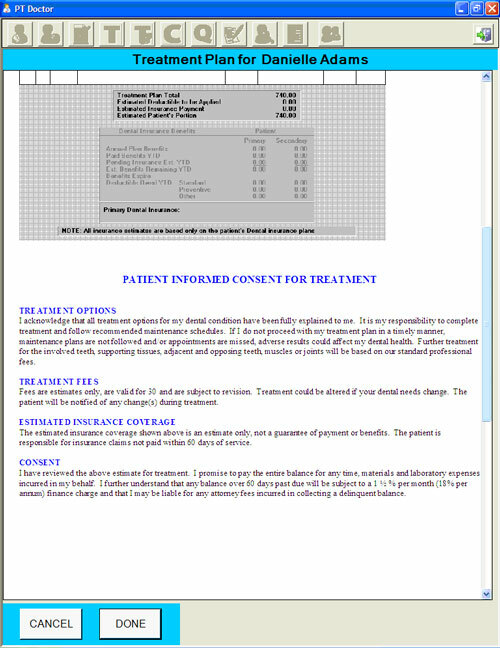 Patients can fill out forms online prior to their appointment so that time in the reception room is decreased. Paperless Technologies has a voice feature for the blind and illiterate, and we also offer documents and voice features in multiple languages.